Alonso et al. 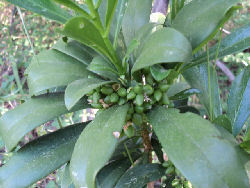 Gender dimorphism and altitudinal variation of secondary compounds in leaves of the gynodioecious shrub Daphne laureola, Alonso C, Pérez R, Nieto PM, Delgado J., J Chem Ecol. 2005 Jan;31(1):139-50. Jaric et al. 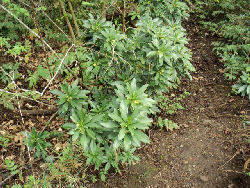 - An ethnobotanical study on the usage of wild medicinal herbs from Kopaonik Mountain (Central Serbia). Jari? S, Popovi? Z, Macukanovi?-Joci? M, Djurdjevi? L, Mijatovi? M, Karadzi? B, Mitrovi? M, Pavlovi? P., J Ethnopharmacol. 2007 Apr 20;111(1):160-75. Epub 2006 Nov 12. 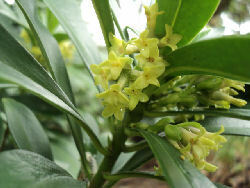 Daphne Sp. are collectively referred to but specifically mentioned in the index, in relation to this information, is D. genkwa, D. mezereum, and D. odora.